This is what you can call a nice surprise: After having been arrested in September 2009 as he arrived at Zurich airport and having spent nearly ten months under house arrest in his chalet in Gstaad, the Oscar-winning director Roman Polanski again has the spotlight on him. Since being freed from house arrest, Polanski actually has seldom made public appearances, but yesterday attended the Lumière ceremony at the Paris town hall, looking happy, honoured, obviously touched by the fact that he’s getting recognition in France, his home country. Recognition for what he is and not for what he might have done decades ago. It’s not an insignificant award since the Prix Lumière is what you could call the France’s version of the Golden Globes. The association of foreign journalist in France generally honours French film or at least francophone ones. Since they made an exception this year, it was obviously because they wanted to set an example. I wouldn’t say that this is a symbolic award though. Ghost Writer is a very good film, probably Polanski’s best for a long time. The American journalist Bill Bradley in a review for The Huffington Post even said it was “one of the best films” he has seen in recent years. The prize is not symbolic, it is political. The foreign press in France wanted to underline what was widely expressed in the media during Polanski’s house arrest: that Switzerland had done an injustice to Mister Polanski. 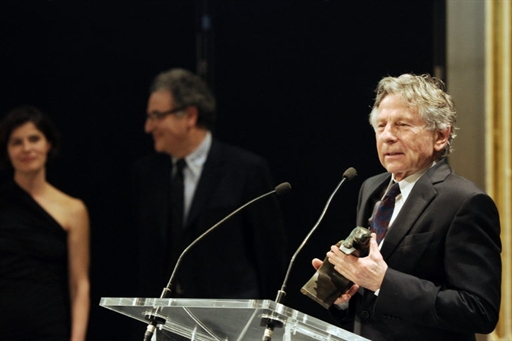 In addition to “Best Director” award, Kristin Scott Thomas presented Polanski with an honorary Golden Panther as the Lumière Academy honored his more than 50-year career with an homage. Together with Robert Harris he was also awarded for the best screenplay. All this looks a bit over the top, you might think, but it’s for a good cause.